While there was never any question that the Death of Hawkman comic was a war story, the super hero and science fiction elements have been driving the tale for the past couple of issues. The mood really changes with issue 3, and this is a war comic now, and one that seems to be moving towards a dark ending. Like, maybe, the death of one of the main characters. I’m not complaining about that at all. Andreyko has done an excellent job laying the groundwork and building the story. With the death of Sardath (still a touch I am not too keen on), Alanna has been pushed into an impossible decision, having to turn on either her husband or her homeworld. Rann and Thanagar seem to be moving unstoppably towards a major conflict. Of course, both Adam Strange and Hawkman wind up determining that the root cause of this entire situation is Despero, who has escaped from his prison on Earth. Despero’s overall plot is not yet clear, but we see him head back to his own world, Kalanor, to recharge his powers and build his army. 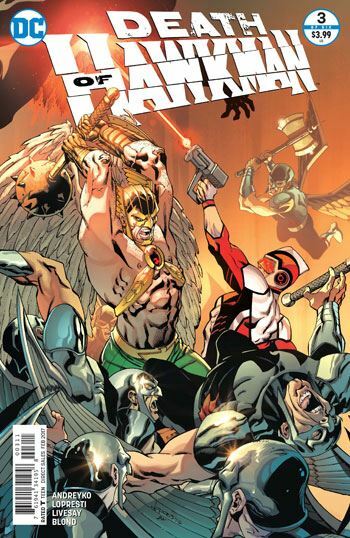 Adam Strange and Hawkman are the only two who suspect that the rival worlds of Rann and Thanagar are being manipulated, and by the end of the tale they have everyone working to take them down, and no one trusting them. An excellent chapter all around, this also features a really funny encounter between a naked Katar Hol and Adam Strange. The art remains firmly family friendly, but Adam’s observation about where the hair grows on Hawkman’s body gives the reader a definite mental image to fill in the blanks.